Rep. Knute Buehler of Bend, Portland retired pilot Greg Wooldridge and Bend businessman Sam Carpenter ended a bitter battle for the GOP nomination for governor. 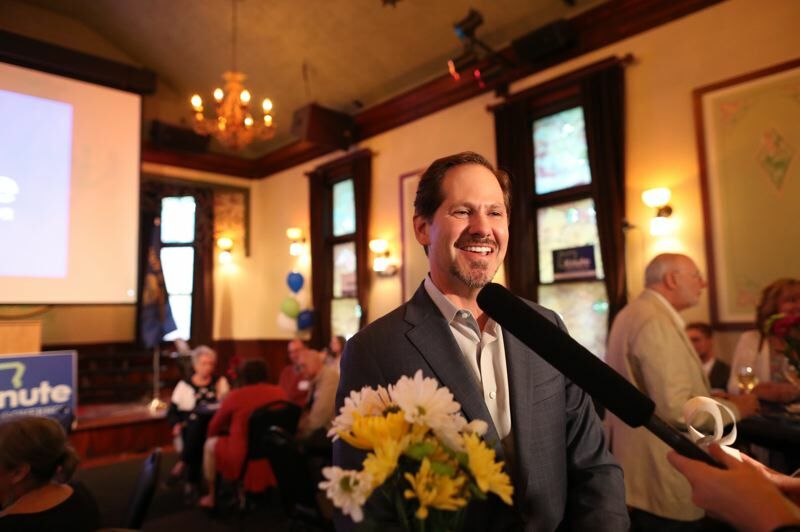 WILSONVILLE — Rep. Knute Buehler has won the race for the GOP nomination for governor, according to unofficial election results. "The change we all need has started with victory tonight and the road to a better Oregon begins tomorrow in earnest," Bueher said to a crowd of 200 supporters Tuesday, May 15. Supporters erupted in cheers and applause just after 8 p.m. at the McMenamins Old Church & Pub, where the state representative from Bend hosted a watch party. Initial results from the Oregon secretary of state's office showed the Bend orthopedic surgeon won with about half the vote. Buehler defeated Bend businessman Sam Carpenter, who gleaned about 30 percent of the vote, and Portland retired Naval pilot Greg Wooldridge, who garnered about 17 percent, for the chance to challenge Gov. Kate Brown, who easily cinched the Democratic nomination. Buehler spoke to the crowd shortly before the initial results arrived and thanked them for their support in laying the groundwork for seeking the nomination for the past four years. "Tonight is the first step in a long journey," he said. Kate Firmin of Lake Oswego said she was relieved when Buehler announced his plan to run for election because his moderate platform appealed to her. "I am right in the middle of the road, and I think that most Oregonians fall in that spot, yet because we have so few people registered for primaries it feels like all of the candidates are far to the right or far to the left, so I am just excited that we have someone running for governor who is right in the middle who I think represents the views of most Oregonians," Firmin said. Despite a large Democratic majority in the state, Buehler said he is confident that he can win independents and Democrats. "I've run two difficult elections and won in a district that is overwhelmingly Democratic actually more Democratic than the state as a whole," Buehler said. "With our experience with winning in a very Democratic district in Bend combined with winning experiences in other states, I am confident that can occur in Oregon. If it can happen in states like Massachusetts and Maryland, it can happen here." Brown's campaign responded that Brown has supported bipartisan legislation that Buehler opposed. "Governor Brown has proven herself as a bipartisan leader," said Christian Gaston, a spokesman for her campaign. "The state's largest transportation package, funding for the Oregon Health Plan and the bill to establish the employer incentive fund to address our pension liability all passed with bipartisan support. Buehler voted against them all." The election results countered the results of a poll last week that suggested the race between Buehler and Carpenter was much closer. The poll was conducted by a Democratic polling firm and was first published by POLITICO. Soon after the poll was released, Buehler and Wooldridge released attack ads against Carpenter, suggesting he might be a bigger threat than initially perceived. The candidates' first and last joint debate on the Lars Larson Show Friday highlighted some of the differences between the candidates. Carpenter modeled his platform after that of President Donald Trump and adopted the motto, "Make Oregon Great Again." Brown's campaign on Tuesday announced that she would agree to three debates with the GOP nominee. She also agreed to jointly appear with the nominee at a number of newspaper editoral board endorsement meetings, including at the Portland Tribune. Buehler has focused on fiscal conservatism. His pro-choice stance and support of legislation to make contraceptives more accessible prompted anti-abortion activists to seek an alternative in the primary. Buehler raised $1.3 million in the first four months of the year but goes into the general election with less than $500,000, according to campaign finance records. He spent heavily in the two weeks before the election on attack ads against Carpenter. He faces a challenge in catching up with Brown's campaign stores. She had $3.8 million on hand as of Tuesday. Wooldridge's campaign thanked supporters and called on Republicans to unite behind Buehler after the difficult primary. "Oregonians are demanding greatness from our government ,and our governor has totally failed," Wooldridge said in a statement. "Gov. Kate Brown's failed leadership has run the ship of Oregon aground. Dr. Knute Buehler is our party's nominee, and it's time to back him and demand change." Carpenter did not return phone calls and text messages seeking comment Tuesday.